19 inch wheels - The 19 inch sports wheels look fantastic. From pictures, way better than the standard 18 inch wheels. However I will say, the standard wheels with aero caps look way better in person than in pictures. The real deciding factor though was range and comfortability. With the standard 18 inch wheels, the ride is smoother. Plus the range is increased about 10km over a single charge. It didn't make sense spending an extra $2,000 for a less comfortable ride plus a shorter distance. Full self driving - The second and only thing I left out in my configuration was full self driving. Tesla has been selling it for years with the promise of something coming at some point in time. It didn't make much sense to spend an extra $4,000 at the time without getting any additional features. However since the car's hardware has everything needed for full self driving, this feature can be added later with a $1,000 extra fee. Elon recently mentioned that some features for full self driving are coming this August. If I had to guess, it would include reading stop signs and stop lights. I will more then likely upgrade when they are released this summer. All in all, I will be out roughly $90,000 at the end of the summer. That is for the RWD with everything included. I probably would've got the performance version if it was available when I purchased my Model 3. Anyways, on to the review! So now that I have shared all the math and numbers, the question remains, is it worth the price? If you don't feel like reading the rest, TLDR: YES! Fit and finish: For reference, my VIN is 27xxx. The reason I mention this is because the early batches had panel gap issues. I was fortunate as my panel gaps were perfect. 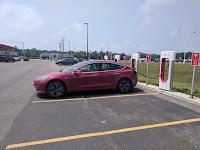 I did inspect the car using the "Tesla Model 3 Delivery Checklist". Everything seemed great. Doors open and closed with a solid thunk. 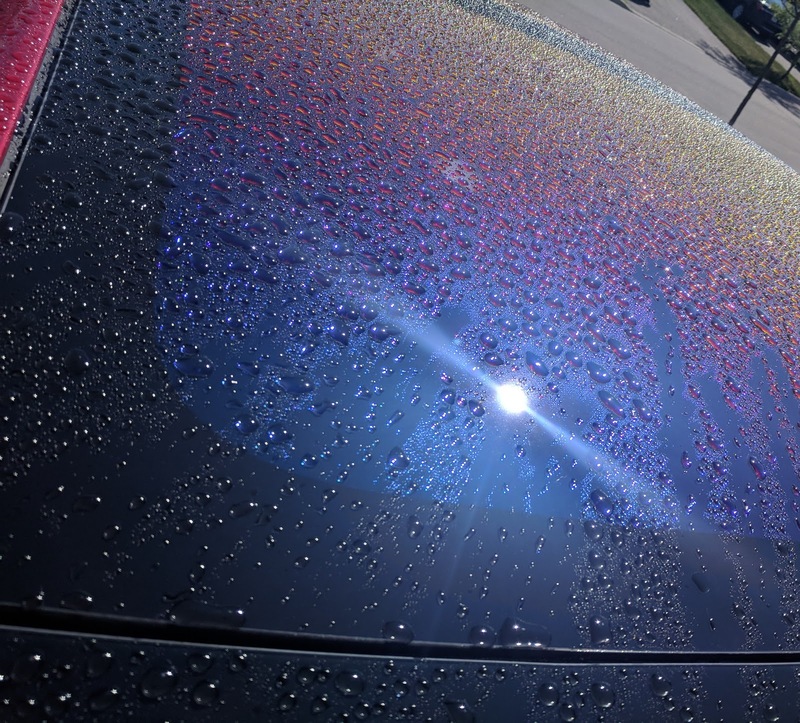 No paint issues. Nothing. Hopefully this is a sign of improved manufacturing. Top glass: This without a doubt was the biggest disappointment I had when ordering the car. The requirement of having a top glass was not something I was looking forward too. My eyes are very sensitive to light and I rather not have added heat in the car. I was gladly incorrect. There is very little "blinding" light that comes into the car. It is remarkable how well the UV light is kept out. It is also interesting how the color of the glass changes when sitting inside based on the weather conditions outside. As for the heat, it does not seem like an issue. Later on in this post, I will discuss the HVAC system. It also plays a factor in the whole heat issue. Just to add, when the glass gets water on it, the appearance is amazing. This picture I shot just does not do it justice. Storage: Between the frunk and the trunk, there is plenty of storage. Having the frunk with clips for bags is super convenient, even if some think your engine was stolen. With the way the back seats fold down, there is plenty of space for transporting larger objects. Screen: Let's start out with the big tablet that is in the middle of the Model 3. I know it isn't driving per se, but it does play a huge role when driving. I honestly didn't think that I would like the speed off to the side. However it is conveniently located in the top left. I hardly have to look over to see how fast I am going. The layout of options and settings is designed in a way that everything is easy to toggle, even when driving (without distracting you). I think the voice commands work well for what they do, however the car needs more of them. I want to be able to set the temperature, change audio inputs, etc without touching anything. A few other points to the screen; Maps. I think it works well for everyday use. 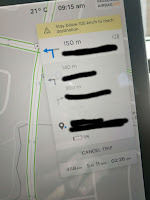 However I do notice a difference between Google Maps and the Tesla overlay on Google Maps they use to add superchargers and other stuff built into the car. I say Tesla overlay, since in the bottom right it does say "Google". Google maps tends to get route directions with traffic in consideration better. The direction steps are on the far right of the screen. I have gotten use to them being there but I think it would be better on the left side. Wheel: The wheel has two buttons. You can spin them to bring the wheel in and out, as well as move the mirrors around. It is so smooth, almost like something out of a video game. The left one controls music while the right controls autopilot and voice commands. Between the simplicity of the two buttons and the screen in the center, getting in other cars just feels so clustered with random buttons and lights everywhere. The simplicity of the model 3 is amazing and really adds to the driving experience. At night, no lights on your dash is a huge improvement. Acceleration: The car is extremely impressive. The 0 to 100km (or 0-60 miles) is a lot of fun. There is a feature that I enabled during the first week of ownership. It beeps you when you are x amount over the speed limit. You decide what to set it at. I suggest you turn it on if you are not coming from an electric car or from something without a fast acceleration. At least until you get use to how fast this car actually goes. Just to add to this; it isn't even the 0-100 that is fast. You accelerate pretty quickly even from 100-130. It is one of things that you need to try to understand. The Model 3 does offer a "Chill" mode. When driving, turning it on prevents that pull forward motion that some passengers complain about (who don't enjoy the acceleration of the car). This mode is also much nicer to drive with when on autopilot. Handling: The Model 3's battery is shorter compared to the wheelbase, making the battery mass more closely concentrated towards the center. With more weight in the center, the easier and faster the spin. This basically all equates to the car being able to rotate really easily. If you didn't understand the above, let me put it another way, the handling on the Model 3 is AMAZING! With little effort the car goes where I want it to. Around sharp turns and bends, the car is just unbelievably responsive. There is three options for steering; comfort, normal, and sport. I personally use normal. All three do make a noticable difference. One Pedal Driving: I came from a gas powered car, so one pedal driving is new to me. 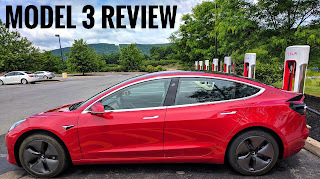 I have driven the Model 3 a fair amount since I took delivery. Getting use to ReGen braking took me a few weeks. Mastering one pedal driving has been a remarkable change. Going back to a regular car feels so weird now. This is not something that often gets mentioned in reviews but this "feature" is amazing. Autopilot: This is by far the best feature in the car. It is worth every penny. I can see and understand why some get into accidents with it, however overall it does make driving more enjoyable and safer. But major news sites would not get clicks for articles titled "Driving around with Autopilot accident free". On my road trip which was mostly highway, I set Autopilot and had the car drive me. The best way to use it though is in bumper to bumper traffic. Never worrying about going and stopping. It is just fantastic! I will go more in depth into this in future posts. 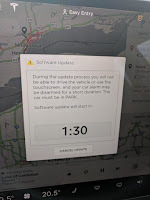 Especially since the car does get software updates and autopilot changes over time. I have the long range battery. This allows the car to be driven 500 km before I have to stop to charge. As many know, when it comes to EV's the Supercharger Network is Tesla's main advantage. You can travel pretty much all over North America without having to worry. The built in maps shows all the superchargers around you. 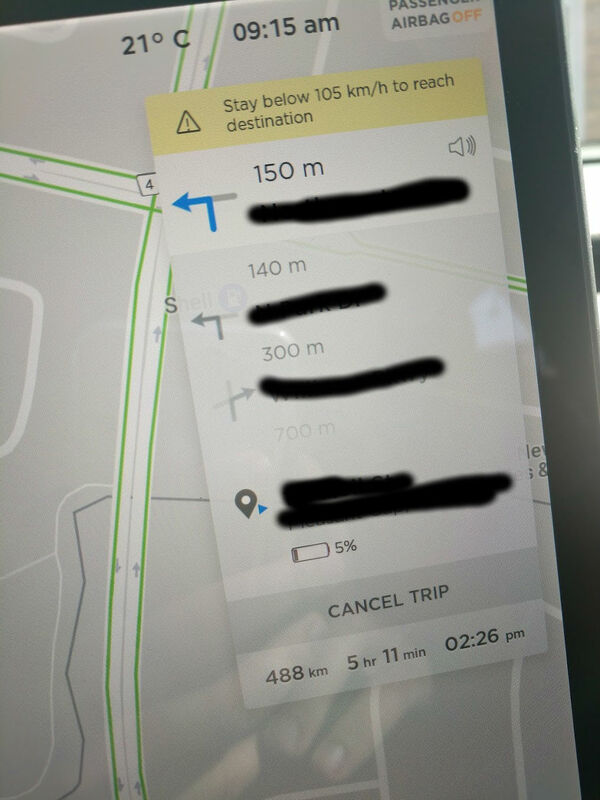 When planning my road trip, I simply entered in where I wanted to go and the car told me exactly when and where I had to stop to charge. The whole charging experience is smooth and seamless. You park by a supercharger. Get the charger and put it into the car the same way you would put gas into an ICE vehicle. Unlike over EV cars, there is no worrying about payments or real charge rates. You get billed based on the Visa on your Tesla account. The price depends on the area in which you are charging. Just to give an idea of cost though, my 1,000 km road trip was under $20. The car chargers pretty fast. At the 3 chargers I have been too, I did not have to stop longer than 20 minutes each time. Have to give credit as well for the strategic location of each charger. There is always things around them from places to eat, or things to see and do. It really makes the whole experience that much more enjoyable. The one interesting thing I found about the maps and planning the route is it's confidence in itself. As I entered my destination, the car originally told me that I could make the trip on a single charge. I would not have to stop at any charger. The catch? I had to continuously drive under a certain speed and I would arrive with 8 km left. As I drove it readjusted giving me a lot of time and notice to stop to charge. Just as an added bonus and I have yet to try it is the mobile connector. You can plug it into a regular outlet but the charging rate will be very, very slow. Once you get use to getting in and out of a car without worrying about starting or stopping it, the switch back to a regular car is strange. The few times I have driven other cars I tend to just get out. Never worrying about my Model 3 is such a small thing but really adds to the whole experience. Even the lack of sound it makes is incredible. It is one of the first things everyone asks, "is the car on?". This is because there is no noise at all. Here are some other things that I wanted to discuss that I did not mention above. There is probably a lot more details and things I could cover but this is the bulk of the important stuff. Updates: So far I have received one software update. I got a notification on my phone. The whole process is fairly simple. 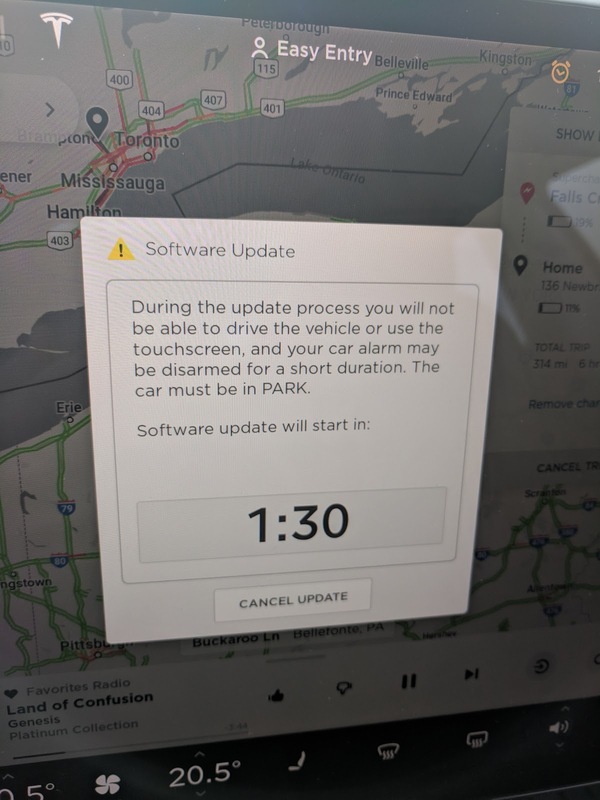 Get into the car and click update. It does say it takes 40 minutes to apply. I am not sure how long it actually took though since I did not stay to time it. The update I applied improved ramp entry and exits. There are things I do hope for in future updates, but once again I will list out these things in a future posts. Phone/Key: The phone is your key and the key card is your backup phone. I am not a huge fan of this system. I am all for technology which was a huge driving factor for buying this car however the phone only works 80-90% of the time. When it does not work, I need my key card. I do like the tap feature on the door pillar. The storage of the card makes one less clunky item to carry around, however I do wish the phone worked more consistently. In terms of phone app functions, I am able to see where my car is at all times. I can open the Frunk, Trunk, see the inside temperature of the car and cool or heat the car based on whatever temperature I want. The phone app also shows me the range that I have left. When charging it shows how fast the car is charging and how much time left to fill up. It is fairly simple and straightforward to use. The one area where improvements are needed is when the phone is connected to the car. Right now you can only make calls with your contacts or entering in a direct number. There is no texting, no notification reading, nothing. Android Auto would have been nice, or at the very least Google Assistant. The voice recognition though is amazing. It can understand everything I say perfectly. However it can only call people and play specific songs or artists. Something I hope they improve on in future. HVAC: One of the first things that catch your attention in the Tesla Model 3 is its long and clean dash. On this dash is two hidden intersecting planes of air for vertical control & lateral fins. I have been pleasantly surprised by the strength of the airflow. Using the touch screen, you can decide where you want the air to flow. You also can sync the temperature on both sides of the car or have the driver and passenger set with different directions of air and temperatures. This quote from Tesla describes the HVAC in more details. Just to give you an idea as to how well it works, a few days ago the mobile app showed the inside of the car at 40°C. I was about to leave so I started to cool down the car. Within a couple of minutes the car was at the set 21°C. I still struggle in when to start the cool down process. The car seems to be cooled down a lot faster than I think it will be. I am probably wasting energy this way. Sound System: I am very pleased with how the Premium sound system sounds in the Model 3. The bass is good and doesn't rattle at high volumes. Included is a stage feature where you can decide where the sound comes from. I have not really played around with it too much. I have just kept the circle option in the center of car so it utilizes every speaker. There is very little that I dislike about the Model 3 (ie: center console wrap). If you have yours ordered and waiting for delivery, you have made an excellent decision. Hang in there a little longer. You will definitely enjoy it. For those who are on the fence and haven't ordered, I will say this; if you can afford it then order one. It is such a fun and absolutely amazing car to drive.